According to the National Center for Injury Prevention & Control, in 2010, guns took the lives of 31,076 Americans in homicides, suicides and unintentional shootings. This is the equivalent of more than 85 deaths each day and more than three deaths each hour, a number that continues to grow each year. "More Bikes Less Guns,” a community project aimed at reducing gun possession within our local community by providing a bicycle for every gun turned into The City of Miami. In preparation for our first guns for bikes exchange event, we have partnered with The City of Miami Police Department to administer proper gun disposal. In addition to having the backing of the Chief of Miami Police, Rodolfo Llanes, we need your support to reach our initial goal of replacing 50 guns in the community with 50 bikes. 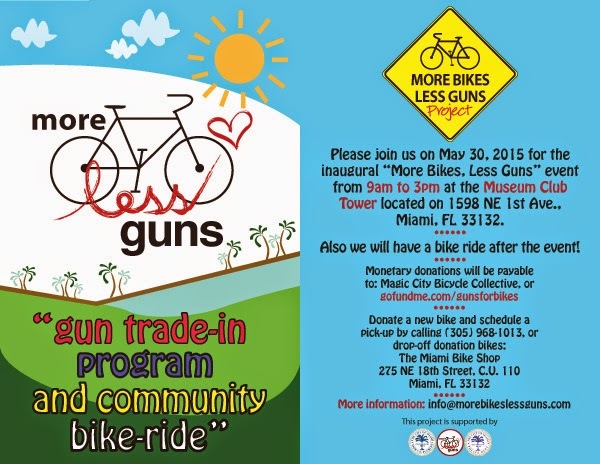 Please join us on May 30, 2015 for the inaugural “More Bikes Less Guns” event from 9am to 3pm at the Museum Club Tower located on 1598 NE 1st Ave., Miami, FL 33132. There will also be a community bike ride starting at 3:30pm plus FREE pizza courtesy of Pizza Pazza. Please join us! Monetary donations will help us purchase more bikes for the program! We'll aslo accept new bicycles and helmets. Thank you in advance for your support. We appreciate your contribution in helping us create a safer community.